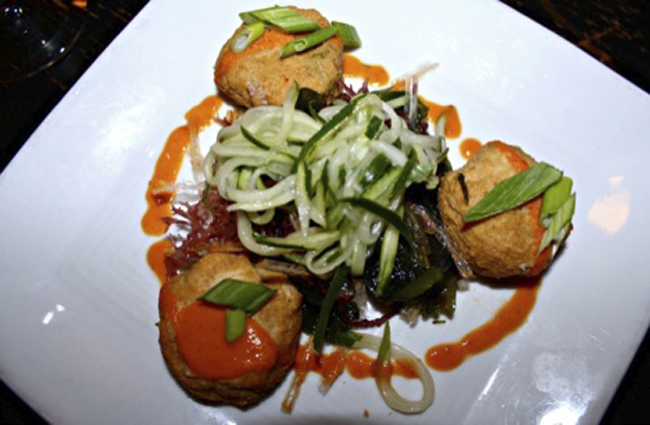 Great Sage, Clarksville, MD – This Vegan-Only Restaurant Wows Plant-Based Diners!! To say that this summer was busy would be an understatement. Planning a crazy beautiful do-it-yourself wedding for my sister, graduating from nutrition school, starting a culinary nutrition program, and working two jobs was maybe a little too much to take on at one time. With the wedding over and school settling into a comfortable rhythm, I finally have the time to write about my recent trip to the truly great Great Sage restaurant. If you live in the Baltimore/Washington, D.C. area and are even the slightest bit of the plant-based persuasion, you’ve probably already heard of Great Sage, an all-vegan restaurant with lots of heart, located in Clarksville, MD. And if you haven’t, let me assure you – it’s worth the trip. Allow me to set the scene. A modern, yet comfortable dining room welcomes you in. Knowledgeable, attentive servers and managers appreciate your coming in and are more than happy to answer any questions and make individualized suggestions. And the food – oh, the food! Let’s get to that.